Significantly alleviates the symptons associated with psoriasis and eczema. PsorCare inhibits the progression of skin diseases (e.g., psoriasis & eczema) by inducing apoptasis (programmed cell death). Can also be used for relief of nappy rash. Instantly treats insect bites and acne. For acne, use yellow psorCare. Made from natural products and safe to use on babies and pregnant mothers. Approved by the Ministry of Health, Malaysia, with registration number MAL06070088K. Black PsorCare (extra strength): Black PsorCare has a stronger, slightly coaltar smell. Therefore, it may not be suitable for use in the workplace. However, it lasts longer on the skin and is most effective. PsorCare Hitam (kuat): PsorCare hitam mempunyai bau yang kuat seakan-akan bau tar dan bagi sesetengah orang, mungkin kurang menyenangkan. Walaubagaimanapun, ia bertahan lebih lama di permukaan kulit. Sesuai digunakan di rumah. Brown PsorCare (medium strength): Brown PsorCare has a milder smell compared to Black PsorCare. It needs to be applied onto the affected area every 3 to 4 hours. PsorCare Coklat (sederhana): PsorCare Coklat mempunyai bau yang kurang kuat berbanding PsorCare hitam. Sesuai digunakan di rumah dan di tempat kerja. Perlu disapu dengan lebih kerap, sekali setiap 3 hingga 4 jam. Yellow PsorCare (regular strength): Yellow PsorCare has a pleasant lemon-grass smell. It is suitable for use in the workplace and suitable for people with thin skin (e.g., elderly people, babies and toddlers, and people with very fair skin). It needs to be applied more frequently (approximately every 2 to 3 hours). PsorCare Kuning (biasa): PsorCare kuning mempunyai bau yang menyenangkan seperti serai. Ia sesuai digunakan di tempat kerja. Ia sesuai untuk orang-orang yang berkulit nipis seperti orang yang sudah berumut, bayi, kanak-kanak dan orang berkulit cerah. Ia perlu disapu dengan lebih kerap, setiap 2 hingga 3 jam. 3 x 10 gm jar: MYR 110 (save MYR 10) . For psoriasis of the scalp, see PsorCare Lotion. For directions on how to use PsorCare, click here. To purchase LARGE PsorCare, click here. 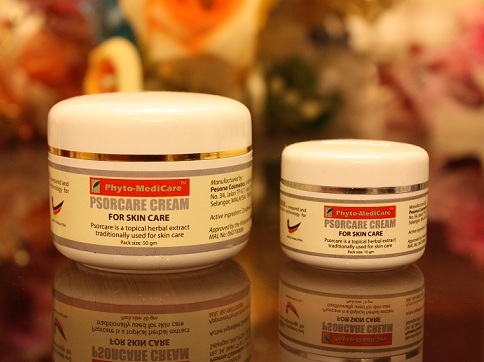 To get free samples of Psorcare Cream, click here.